What It Is: Happy Easter y’all! Hopefully you’re having a peaceful, restful kinda day. 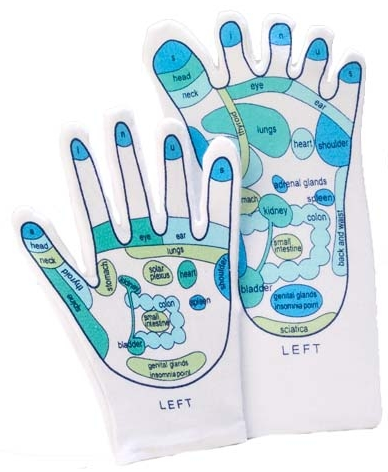 Here’s a gift idea to help you unwind even more – reflexology gloves & socks that gives would-be massage therapists and actual practicing reflexologists a road map to stimulating various parts of your body. If you’re unfamiliar with reflexology, it’s a cross between massage (which focuses more on muscle tension) and say, acupuncture, which uses needles to relieve stress, pain, and general body ailments or discomfort. Reflexology is all about using pressure points to help your body relax. These handy accessories make it easy for you to plop your feet in your hubby’s lap while watching TV, or to give your arthritic mom a hand massage after a day of taking care of your kids. Who It’s For: Your spouse, as an alternative to endless back rubs. Your battling-an-ailment friend, to give her yet another avenue to try and relieve whatever’s troubling her. Your holistic-obsessed sister, to add to her cadre of natural remedies. What It Costs: The gloves are $10, the socks are $12. Makes for a fab stocking stuffer idea too! Want a bonus Ezensa entry? Tis simple. Just tell me how you’re celebrating this Easter Sunday (or if you are) in the comments below. Make me happy and tell me if the idea of a homespun reflexology massage is your idea of heaven. We are invited to friends home for supper. I’m not sure about the reflexology massage, I’d have to try it. Gathering family from far and wide, (two country’s) and enjoying a wonderful feast. I would love the homespun reflexology massage if I could find someone willing to let me plop my feet in their lap! Going to Easter lunch at my partner’s parents house. I absolutely love reflexology, so yes! Ezensa bonus entry: I’m celebrating Easter Sunday alone so I guess that means I’m not. Looks like I’ve got the time to try out this idea of a homespun reflexology massage, on myself! haha, at least I can tell myself where it hurts. Thanks for the intro. I have always wanted to try reflexology and these gloves and socks look like the easy way to try it first! I’m not doing anything today as my mom is having Easter dinner tomorrow.